Technology installed: Värmebaronen Vedolux 30 wood boiler and three 500 litre water storage tanks to supply space heating (via underfloor heating) and hot water for the household. 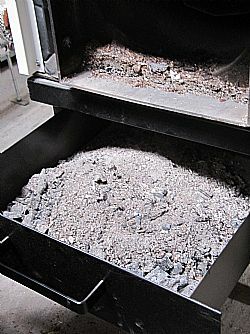 Wood burners work by gasification; wood is super heated in a low oxygen environment to create a gas (syngas). This burns at a far higher temperature than just burning wood so is more efficient at heating up the water storage tanks. One load of logs is enough to heat the 1500 litres of water to 80ºC. This water is then circulated to the house to provide space heating and to an internal water tank to heat up the household hot water (via coils that pass through the tank). The tanks are designed to be able to be heated independently of each other so if you only need to heat up as much water as required. 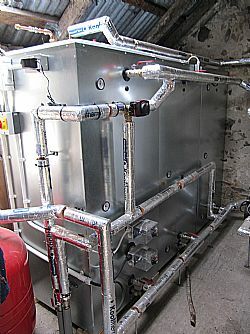 An 11kw electric boiler which supplied the hot water for the underfloor heating system. During the very coldest months this system could use up to 60-70kWh per day to heat the house. The house also has solar thermal panels for the household hot water which can now be combined with the new wood boiler as the technologies use the same coil system to heat the hot water. Renewable Heat Premium payment of £950 (grant). (In May 2013 this payment rose to £2000 which the owner may be eligible for). Energy Saving Trust Renewable Loan of £10,000 and will be eligible for the Renewable Heat Incentive payments when they come in (expected spring 2014), current suggested tariff is 5.2-8.7p/kWh for biomass boilers. In order to minimise the costs the owner took on some of the work including laying insulated pipes from the system in the outbuilding to the house. It also required a water supply but in this case there was an outside tap located conveniently near to the installation point. Several months of planning, including a home visit to an installation near Appin and a visit from the Energy Saving Trust, but only 4 days to install. 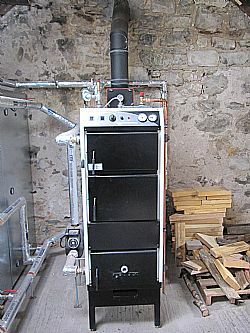 The owner has access to plenty of waste wood which he can use to feed the boiler for free. However, this does take time to cut and store plus the boiler needs manual feeding. The owner states that the main drawback to a log boiler is the fact that it requires manual feeding, this means that it not the technology for everyone. However, as he had a ready supply of wood this was the obvious choice for him as the running costs will be extremely minimal. When trying to decide on which technology or what specifications to go with the owner said that sometimes the amount of information was overwhelming. He says that the best advice is to take your time and to get a comprehensive understanding of your household needs before taking the plunge. Additionally you need to be prepared for the learning curve that follows post installation. It will take a while to get used to your new technology but it is worth spending the time to figure it out to make sure you get maximum efficiency both for energy generation and your own needs. Perhaps would have installed a small wood burner in the house which could also have been connected to the hot water system. Estimated savings on electricity bills are expected to be around 10,000kWh per year (£1350 @ 13.5p per kWh) which would mean an approximate 8 year payback period. However this will hopefully be shortened by the introduction of Renewable Heat Incentive payments.